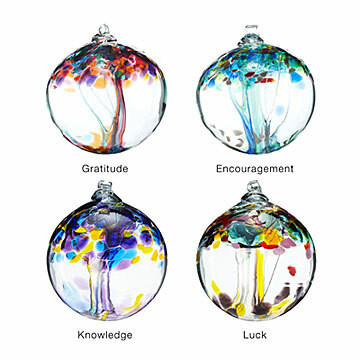 Encourage, thank or inspire those dearest to you with Stephen Kitras' recycled glass globes. Encourage, thank or inspire those dearest to you with elegant 100% recycled glass globes, featuring an interior glass trunk that branches out to support vibrant splashes of color. Use the included translucent twine to either hang the globe from the display stand or elsewhere. Handmade in Canada by Stephen Kitras. Tree of Prosperity: Just as a tree is prosperous when it is full of leaves, bearing fruit or providing a shelter, we too can find prosperity in many different ways. The Tree of Prosperity reminds us that by finding our true happiness or helping others we may grow and prosper. Tree of Gratitude: Every day we are surrounded by many gifts. By taking the time to celebrate these gifts we are able to feel gratitude for the people or circumstances that allow us to have what we do. Gratitude can come in many forms and just like the roots of a tree, it can be deep and everlasting. By showing gratitude to those around us we acknowledge their efforts to make our lives and the lives around them meaningful. Tree of Encouragement: Just as a mighty tree was once a small sapling, our goals, dreams or hopes were once small. As we work hard and we surround ourselves with people who support us, we are able to achieve those dreams or conquer barriers we once thought impossible. The Tree of Encouragement reminds us that while the path may be long, we are not alone, and with the support of others, anything is possible. Tree of Knowledge: Like knowledge, trees branch out as they grow. This globe serves as a reminder to keep looking for new pathways and connections as we mature, build on the knowledge we accumulate, and cultivate wisdom. Tree of Luck: Trees provide shade, sustenance, and inspiration--lucky for us! This globe stands for the fortunate surprises that come along when we need them the most. Not intended as a tree ornament. Uncommon Knowledge: To make these pretty globes, artist Stephen Kitras first has to receive a shipment of broken glass from a supplier in Seattle that makes windows for cars, homes and offices. They send their broken shards to Kitras, who then melts them down in a furnace for 12 hours before creating his signature pieces. Click here to see prosperity. We visited Stephen Kitras's glassblowing studio in Fergus, Ontario, and made a glass globe of our very own. Visit our blog for the inside scoop. The mantra "when surrounded by beauty, the spirit is uplifted" embodies the mission of Kitras Art Glass. Stephen Kitras began work as a glassblower in 1988, and in 1994 he formed Kitras Art Glass with his wife, Elke. By 2001 the company had expanded to over 40 employees and a new facility. It is Stephen's goal is to design and produce affordable glass art objects to enhance the lives of others. "I think it’s good to make beautiful things and celebrate beautiful moments," he says. "They happen every day, all around us." Not intended for use as a holiday tree ornament. Indoor and outdoor safe due to sealed glass. The included wire is not a permanent way to hang the globes. Use your own sturdy fishing wire or ribbon to hang. Secure knots tightly, and consider doubling knots before hanging. Much bigger and prettier than I expected. I gifted one and the others are hung from my chandelier in my dining room. The artist did an excellent job! It was bigger than I had imagined it to be - bonus! Beautiful, elegant and my friend has very much enjoyed it. A lovely gift for a friend in need of cheering up! Th product is beautiful and attached is a beautiful explanation of the meaning however, it does not come with hooks or material to hang the bulb on the metal tree which I purchased separately. This is disappointing. I have given these as gifts to friends and coworkers and they are always well received. They are larger than standard tree ornaments and quite dramatic. I really like selecting based on something personal with the recipient. I gave different ones to all of the folks on my team at work and the sentiment behind the selections and the beauty of the item was perfect. Wow! This beautiful glass sculpture exceeded my expectations! Larger than I thought it would be and even more colorful in person. I purchased this as a gift for my "hard to buy for" dad and cannot wait for him to open it!